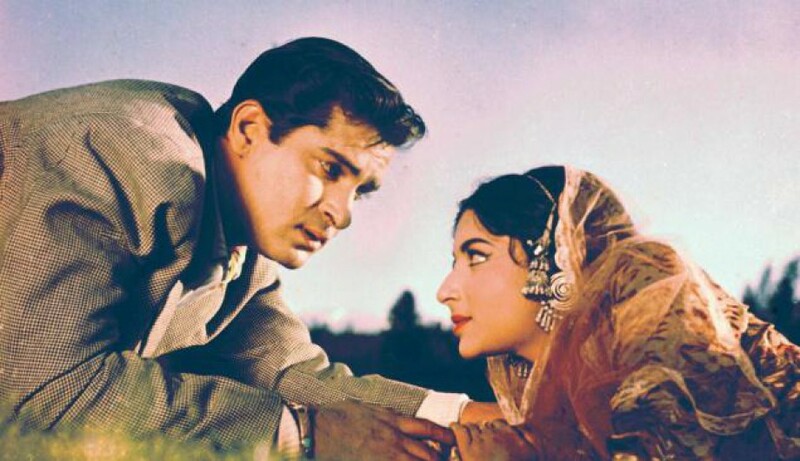 If you have read any of my older posts, you would know about my fondness for Shammi Kapoor (well, you do not even have to read any post; the image in the banner is probably enough!) And then October is such a special month – Shammi Kapoor’s birthday would have turned 86 today (October 21). To coincide with this day, I was initially planning to review Rauf Ahmed’s biography. However I received some news a few days back that disturbed my peace of mind. Since I couldn’t get into the frame of mind that one requires for reading a book intended for a review, I watched Kashmir ki Kali (1964) for the nth number of time. So the movie begins at a mill’s twenty-fifth anniversary celebrations. The loyal manager, Shyam Lal (Madan Puri) addresses the workers and announces that the mill will now be taken over by Shri Rajeev Lal (Shammi Kapoor), the son of the deceased mill ka maalik, Shri Sanjeev Lal. The heir apparent takes centre-stage and announces a 5 lakh reward to the workers – after all, “maalik aur naukar ka rishta badal chuka hai and yeh mazdooron ka zamana hai.” He is clearly a young man of the times, fully in sync with the prevalent Nehruvian socialist agenda. While his shocked mother and manager have no choice but to agree to this proclamation, they soon hold a conference as to how to handle this man. His old nursemaid, Karuna (who has a different opinion), also butts in this conversation and adds her two cents. The young man must be married off, it is decided. A procession of eligible girls is soon presented for Rani Maa/ Mataji’s approval. Just as Mataji has found a girl of her choice (after rejecting one for being too modern and another for being too traditional), Rajeev enters the room. He quickly assesses the situation and since he is unwilling to be led to the altar, he puts on an act of being a mute, dumb, deaf, mad guy with a pronounced limp. As expected the girls disappear and Mataji is furious. Rajeev couldnt care less; he tells her pointedly that he has no wish to marry a girl of Mataji’s choice – he will marry a girl of his choice. An argument ensues between the mother and son, following which Rajeev runs to the club to meet his friend Chander (Anoop Kumar). Rajeev confides in Chander, who along with a drunk colonel in the club, convinces him to run away to Kashmir. Rajeev takes Chander’s car and off he goes. The beautiful scenery in Kashmir plays tricks on his mind; so our hero who had sworn never to get married in the previous scene starts singing a song about meeting that special someone, some where, some day, some time! A wooden bridge enroute to Srinagar has collapsed, forcing our hero to seek shelter at a local sarai that night. Unfortunately, a group of flower girls including our heroine, Champa (Sharmila Tagore, extremely charming in her debut role), accompanied by Mohan Seth (Pran) are already occupying the two rooms in the inn. The inn owner allows Rajeev to sleep under the staircase and light an angithi for warmth. A resulting confusion, with the girls thinking that the inn is on fire and pouring water on the angithi ensures that Rajeev and Champa meet! The next morning, on his way to his home in Srinagar, Rajeev once again comes across Champa (whose name he knows not) and the other flower girls and tries to find out her name. He even pretends to be a driver just to get her to talk to him. Mohan Seth thwarts this meeting and soon Rajeev gets to his house to find out that Bhola Ram (Dhumal), the caretaker had converted it into Hotel Lakeway and had let it out to a three young ladies, Chhaya, Maya and Rekha and their guardian, Rama Devi (Tun Tun) for the entire season. This is a parallel comic track in the movie, where in Bhola Ram paints Rajeev as a crazy friend of Seth Rajeev Lal. (His antics definitely convince the four women!) Since Mataji is now trying to trace him, Rajeev plays along with this charade. Meanwhile, the romance between Rajeev and Champa is quickly established (he engineers a meeting with Champa on pretext of buying flowers and buys her entire stock at four times the price). Champa’s blind father, Dinu (Nazir Hussain) expresses his displeasure and distrust about her new acquaintance and forbids her to meet him. She agrees and returns the extra money to Bhola Ram. Meanwhile, Chander, now impersonating Seth Rajeev Lal, also enters the fray – Chhaya, Maya and Rekha all try to woo the fake Rajeev Lal, giving much scope to both the asli and naqli Seths to carry on with their antics. Rajeev manages to woo Champa (aided by so many lovely songs) and win her trust soon and they are very much in love. Mohan, who also has set his sight on Champa, disapproves and starts blackmailing Dinu in order to win her hand. The lovers manage to hoodwink Mohan many a time – through disguises and such ploys and continue meeting. Mohan threatens Baba (reminding him of his own power locally and Baba’s status as a fugitive criminal) and tells him that he would make Champa his – by force or consent. Mohan suspects that Champa is not this blind old man’s daughter. Dinu, who would like this secret to remain one, relents and Champa’s movements are curtailed. The entire truth about Champa’s parentage is found out first by Mohan (as he overhears a conversation between the blind man and his friend). The story and its numerous plot complications kick-in. On one hand, Mohan is hell-bent on marrying Champa, on the other the three girls at the hotel figure out the identity of the real Rajeev Lal. Just when his cover is blown in front of Champa, Rajeev gets called back to Bombay. His nursemaid, Karuna is dying. On her deathbed, she tells him the truth. He is not Seth Sanjeev Lal’s son; he is her brother Dinu’s son. Dinu, an alcoholic those days, had sold him off to Karuna. And Mataji had taken him in. Mataji had given birth to a baby girl who had been stolen by Dinu as well. What happens next? Does Mohan marry Champa? Does Champa figure out she is the true heir to Seth Sanjeev Lal? Does Rajeev forgive Dinu? Do Rajeev and Champa get married? The rest of the movie answers these questions. It is a quintessential 1960s movie – light, breezy and entertaining. Do not expect too much logic and do not ask too many questions about the convoluted story. The acting is superlative. Shammi Kapoor is in his element – as he jaunts, hops, skips and throws himself around in the first half. The second half sees him don a more serious stance as he suddenly realises the benevolence of the lady who has taken him in and feels indebted to her. Spot on. Sharmila Tagore is delightful, as she plays the innocent Champa to the hilt. The role is rather one-dimensional with not much scope for her other than to look Pran brings in his inimitable style as he plays the villainous Mohan to perfection – the way he pronounces Champa (Shampa) is charming. The supporting cast – Nazir Hussain, Anoop Kumar, Dhumal and Tun Tun are effective. What can I say about O.P.Nayyar’s delectable soundtrack? It remains one of my all-time favourites. Each and every number (sung by Asha Bhosle and Mohd Rafi) is a masterpiece, remembered till date – be it Yeh chand sa roshan chehra, Isharon isharon mein dil lene wale, or Subhanallah haseen chehra. My personal favourites from the album are Deewana hua badal and the Asha solo that was probably never picturised, Balma khuli hawa mein. Kashmir ki Kali, even after countless viewings, is still a comfort watch – predictable, light and easy on the eye. This entry was posted in Movie reviews and tagged Anoop Kumar, Asha Bhosle, Dhumal, Mohd. Rafi, Nasir Hussain, Nazir Hussain, O.P.Nayyar, Pran, Shakti Samanta, Shammi Kapoor, Sharmila Tagore, Tun Tun. Bookmark the permalink. This is one of those odd Shammi Kapoor movies that, despite the fact that it does tick all the boxes (and I’ve seen it a zillion times), somehow isn’t as much a favourite of mine as (say) Junglee, Professor or Dil Deke Dekho. And I’ve not been able to really understand why. I mean, Shammi is in his element, Sharmila is lovely, the settings are gorgeous, and the music is fabulous. But still. Dil Deke dekho and Professor are way better movies than this one for sure.. KKK remains a favourite, I suppose, because it was the first Shammi Kapoor movie I ever watched. And of course the music. Funnily, I do not like Junglee as much as the others. Just discovered your blog while searching for Shammi related stuff. I am a newly converted fan (less than 2 weeks)!! Already ordered his biography you mention, hope it’s a good read with loads of info I still haven’t found in the internet 😉 I hope you write more on his movies!